Bon Marche might not be the first place you think of to get an on trend item of clothing but this fabulous pastel jumper proves you can find some real gems there. I've been wearing this a lot and love the hint of glitter in the knit and have had a few compliments while wearing it. 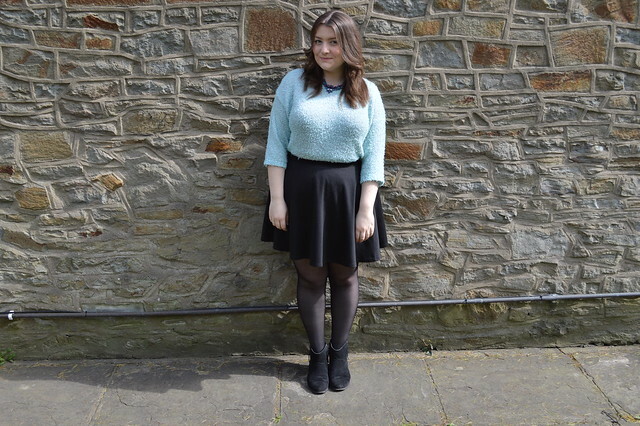 I don't normally wear knitwear as it makes me feel a bit bulky but this is nice and light. The necklace is something I've never worn before and discovered it when I was packing to move house recently, can't believe I forgot about it! The move has helped me rediscover loads of lovely items and I'm sure that once I've settled in I will be able to share some of my lovely items that I had forgotten all about on here with you. As I said, knitwear isn't something I normally wear and I avoid pastels and light colours completely and opt for black and sometimes a splash of red so I was really out of my comfort zone wearing this. I wasn't sure what to pair this jumper with and I really wish I had known about a new site called Motilo at the time I was deliberating about this outfit. Motilo is the world’s most interactive, intelligent and exciting solution to your styling needs. The company has a team of fashion advisers that are ready and more than able to provide quick feedback on any style worries— from the type of clothes you should wear to a specific event to which handbag you should match with a particular outfit. When shopping on the high street you often have a friend or relative who can give an outfit the thumbs up or thumbs down. Motilo’s team provides that human touch to the online experience which I would say is the downside of shopping online. I love the convenience but shopping online always results in my sending loads of items back because you can't really tell if it's going to go with the rest of the outfit from a photo online. This site lets you get feedback before clicking 'buy' which is a pretty nifty idea. It's a mix of magazine, social media and an expert you can trust. I log the fact that you can specifically ask a question and get an answer. Some sites just encourage people to share photos of outfits but you can ask how you can wear pastels, pumps, the Americana trend etc The possibilities are endless. But there’s also some highly interesting editorial to get you in the shopping mood; Anna dello Russo, Bip Ling and Valentine Fillol Cordier are all on the roster of ‘Motilo Girls’ so the site has plenty of content to fill your fashion needs. Have you headed over to this site yet? I'm finding it a pretty handy tool. It's been a truly mad week because it's the end of term so lots of students have stumbled into the library for the first time this year to get books for their essays. How can someone doing their dissertation not know where the journals are? Madness! I'm really looking forward to a weekend in London to see the Manics with Hannah and do a little shopping and sightseeing. I'm around all day Saturday and Sunday so let me know if you fancy a bit of a blogger hangout. I'm thinking burgers and a chat :) What are you up to this weekend? 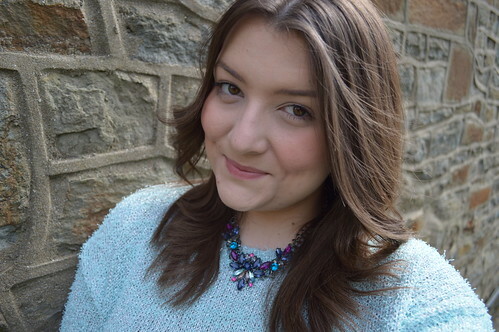 I adore this jumper + necklace combo! gorgeous! 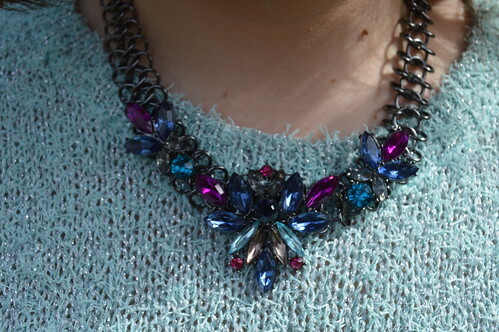 Gorgeous jumper, I love the colour and your necklace is lovely! Lovely shade, suits you and Bon Marche has got some surprises. That necklace is gorgeous!! I do like a nice lightweight knit, and the necklace goes so well with it. I'm at a wedding this weekend or it would have been lovely to meet you while you're in London. I love that necklace. Have a fab weekend! You look gorgeous here, I really love this jumper. Good choice missus!